Ric-Boy X-Plus Reissues! Medicom Marmit Monster Heaven Vinyls! It’s a Collector’s Update! – SKREEONK! Hey Kaiju Fans! Jon @ UnCanny here with a long-overdue Collector’s Update! After a long and hellacious dryspell the kaiju collecting world has been set a-blaze yet again, all thanks to the tremendous success of Legendary’s GODZILLA! Companies like Diamond are still pumping out reissues and new Godzilla merch (which is a very big deal, honestly) and companies like Medicom (Marmit) and X-Plus now getting in on the reissue train – it’s a damn good time to be a fan! Or is it a DAM time, perhaps? Surely you get that reference if you’re on this site. Surely! 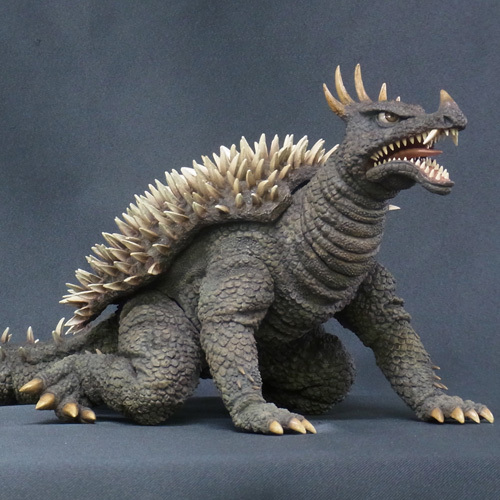 Anyway, X-Plus announced last night that their latest Ric site reissue will be the coveted 25cm Anguirus, and the special Ric edition at that! Preorders on these guys are extremely limited, so get one now while you can! You’ll have to sign up for a forwarding service like TENSO, but it’s not rocket science – so make it happen! The yen is down and Ang can be yours for literally $112! Insanity! Ang is one in a long line of reissues X-Plus is hitting us with, with the likes of the 30cm Gigan light up Ric announced last month, and the 25cm G’68 and Minya Ric before it. This is all, no doubt, to correspond with the release of Ghidorah this past December. I, along with many other collectors, suspect that X-Plus will be reissuing their entire Destroy All Monsters (do you get it now?) 25cm lineup to cash in on Ghidorah’s release. That, and we know they’re 100% aware of Diamond’s X-Plus reissue success. My guess? X-Plus is cutting out the middle man and is going to do their own reissues from now on. We still may see more non-Godzilla X-Plus reissues from Diamond in the future, but for now I wouldn’t count on it. Outside of X-Plus, Japan’s Vinyl Wars line is going strong with a ton of variants, as are their stateside releases through Diamond and Medicom! Marmit Monster Heaven DesuGojis are popping up like wildfire, and we’ve got everything from MMH G’84 and G2K to reissues of Bear Model’s and giant Marmits headed our way within the next few months! If you’re looking for any of these I’d recommend starting with Entertainment Earth. All other retailers will be all sold out – so either Amazon or Entertainment Earth will be the way to go. Below is a gallery of the upcoming Marmit and other stylized vinyl releases you’ll be able to get your hands on, each ranging from $59.99 up to $109.99. There’s plenty of other great vinyls G-Merch on the internet right now as well, such as metal bottle openers and even a pizza cutter – so be sure your wallet has health insurance! Looking to order any of the sweet items above? We’ve made it super easy for yah – CLICK HERE AND START COLLECTING! Good luck and happy vinyl hunting! Next Post It’s That Time of Year Again! The Great Kaiju Sale of 2015 Has Arrived on the KFM! Previous Post Artist’s Spotlight – Incredible Figure Posters by Artist John Ruffin!